The city-based husband-and-wife duo, Avanti Natarajan and Rajavel Sundar, have launched their calendar 2019 titled ‘The Southern Trail’. The city-based husband-and-wife duo, Avanti Natarajan and Rajavel Sundar, have launched their calendar 2019 titled ‘The Southern Trail’. It captures the age-old crafts of two places from south India — Athangudi (Sivaganga district) and Channapatna (Karnataka). Their company, The Art Brew, puts together these two crafts with Athangudi tile designs donning the leaf and Channapatna crafted stands, known for their medicinal properties and natural dye. “This is our third calendar. I was, accidentally, painting a tile design during a water colour workshop. My husband suggested that we base the theme on this. The calendar stand can be used round the year as a photo frame, wall decor and more,” said Avanti, an architect. For most of us who follow the Instagram page ‘Awkwerrrd’, the posts are easy to relate with on a daily basis. Kochi-based freelance artist and illustrator Bhagya Babu uses web comics as the tagline of her page. She has released a tabletop calendar featuring classic ‘Awkwerrrd’ family situations. It comes with a sticker pack including new characters sketched by her. Every month has brightly coloured holidays and important dates. “Peppered with humour and shades of bright colour, this will find the likes of many across age groups. I’ve given white spaces inside the boxes to write notes and use it like a planner. People relate to my simple Mallu jokes. I’ve also picked out seasonal days and cracked jokes around them,” said Bhagya. “How do you manage to stay disciplined and juggle your work-life balance?” is a question that people have for Pranita Kocharekar. Having monthly goals and accomplishing them has helped this freelancer grow as a person. She has two calendars. The first one is called ‘12 months, 12 goals’. Every month has small goals to achieve. For instance, a reminder for drinking water. Her second one is called ‘Shut up & stop stereotyping’, featuring conversations revolving 12 issues. “For someone who never read a newspaper, I’ve come a long way in understanding several gender stereotypes recently. I want the right message to go out through my calendars,” said the Mumbai-based freelance artist. What started out as an annual practice of preparing calendars and planners for herself turned into a profession for Atika Mittal. Her calendar is a combination of poetry and painting. She also customises based on individual requirements. “Literature and poetry are close to my heart. This year, I decided to use Haiku form of poetry that involves fewer words and has an in-depth meaning. The poetry warms up the heart and the designs go along with the theme. 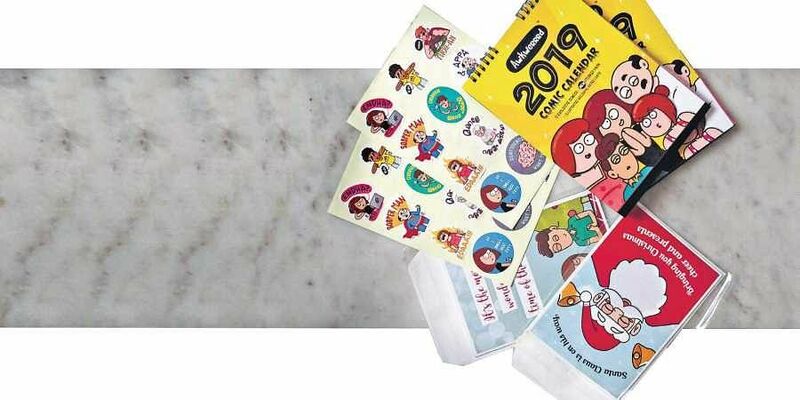 These tabletop calendars are much sought after among corporates as a gifting option. Once, my client wanted me to mark the birthdays of his favourite authors so he does not forget,” said the Noida-based associate consultant. Four concepts and over 1,500 doodles. S Srirama Santhosh’s motto behind his artwork is to spread positive messages. He has four themes — Positive doodles, Success mantra Ganesha, Happy being doodles and Ramana Maharshi illustrations. He has created a family in ‘Happy being series’ to bring out the value of relationship and personal touch among the millennial crowd. Ramana Maharshi is the only one calendar with illustrations of the great saint while the others have colourful doodles. “These tabletop calendars are a huge hit among corporate professionals. People prefer thoughtful artworks that are appealing to the eye. Many kids are fond of these doodles. It feels good to be a part of someone’s everyday happiness,” said the city-based artist. “The idea popped up when I was making a personalised calendar for my husband who is a musician. There are many people finding it difficult to strike a balance between their career and passion. I want my work to remind them of their every day priorities,” said Deepa Mistry who lives in Ahmedabad. The 2019 self-help desk calendar reminds you of important days, deadlines to be met and annual targets. It acts as a constant reminder to make some time for yourself and the simple design element makes it user-friendly even for the elderly crowd. Tiny boxes are allotted for notes and can be used as a planner. Lastly, there’s space for you to make note of three goals a month.